This weekend, our ornate downtown theatre (circa 1928) held an Antiquefest. What a great setting for vendors to set up their booths stuffed with antiques. Fred and I volunteered at the event so I made the rounds of the various rooms several times and did some browsing while directing people to the bathrooms and coffee. I was on the lookout for pens but only saw a few that were in exceptionally sad shape. No luck there. 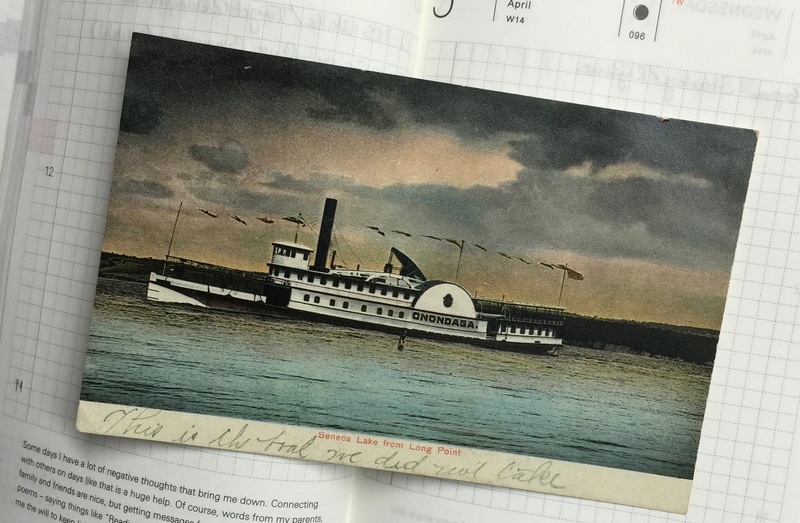 But amongst the furniture, furs, jewelry, linens, and books, I spied a box of carefully categorized vintage postcards and started leafing through them. I skipped to the “New York” section, thinking that there might be some familiar attractions. It didn’t take long before I selected the card shown above. $1.00. Sold. I should note that I’m not a collector of postcards, but this one tugged at me. 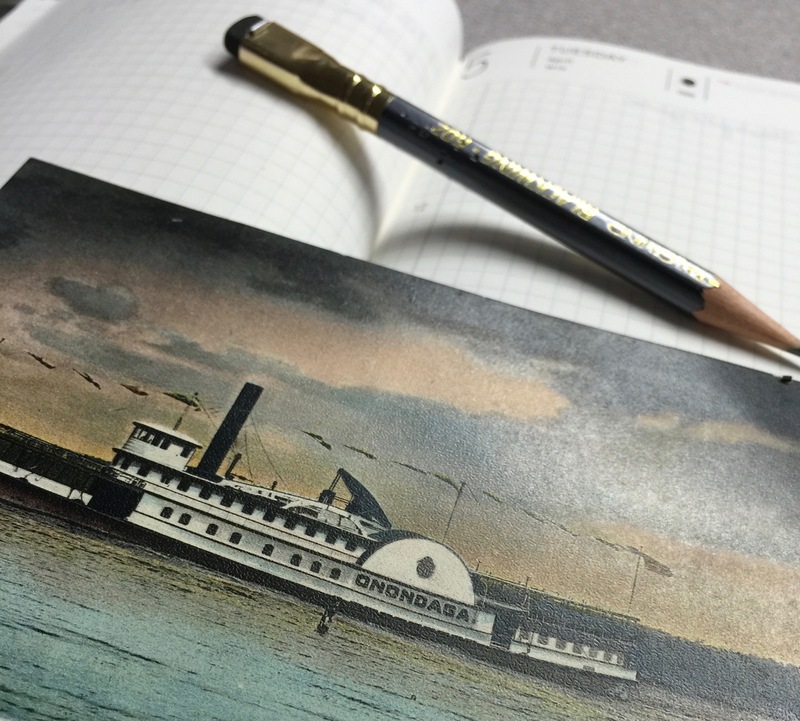 It’s from a time when postcards were little works of art, not kitschy souvenirs. This one was made in Germany, then sold here in New York, out in the Finger Lakes region, a prime location for vacation and relaxation. On the front, the writer has scribbled, in pencil, “This is the boat we did not take.” I hear frustration in that single line. This vacation, it seems, has hit a snag. More frustration. The need for Plan B. We’ve all had vacations like this. “Have walked about forty-eleven miles.” What an interesting phrase. A quick Google search turned up a number of references all explaining that this means “innumerable” or “a large amount.” Why have we stopped saying this?! 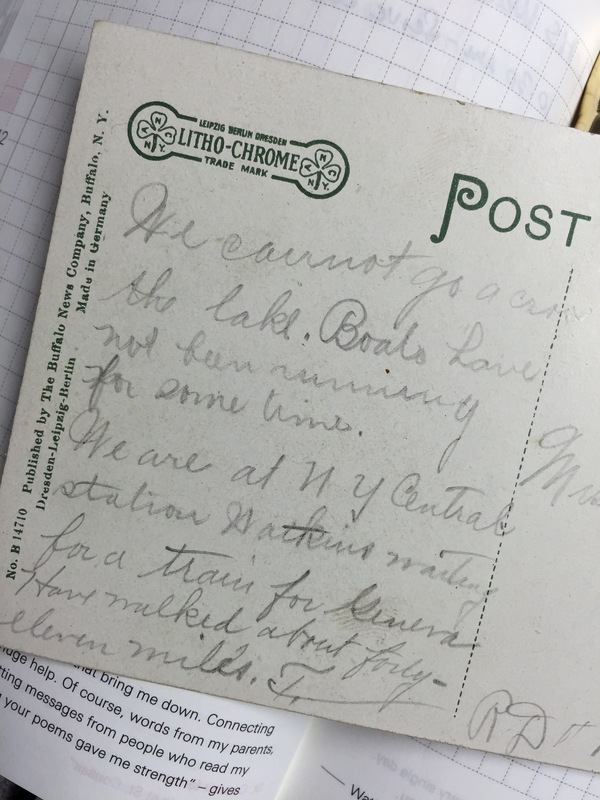 Addressed to Miss Hatty Harding of Waverly, NY, this penciled postcard was written and posted in September 1910. 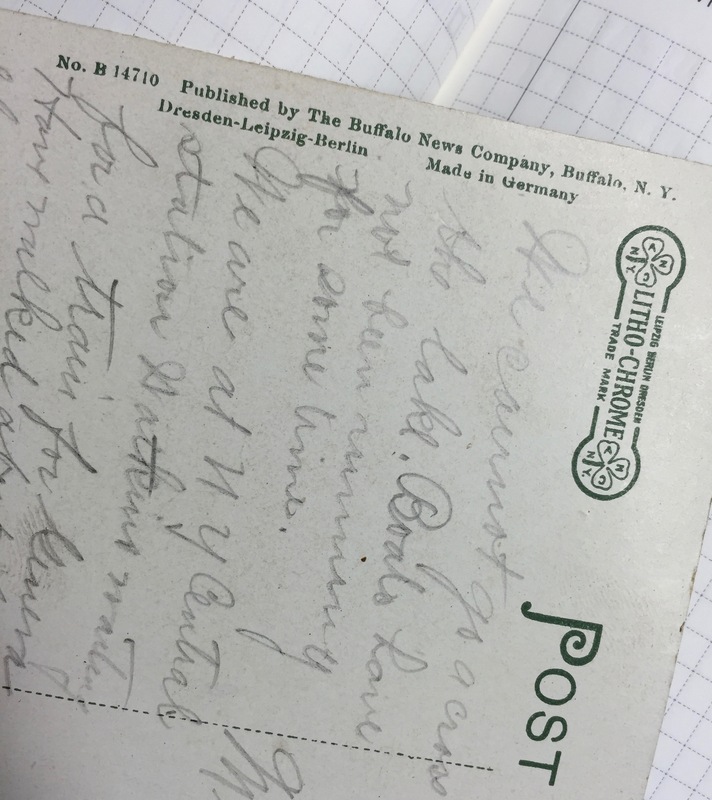 This postcard—my postcard—is 106 years old, and still perfectly legible. No fading, no smearing, no discoloration. That’s impressive for forty-eleven years. For a modern take on the same subject, check out The Purl Bug’s postcard/pencil experiment HERE. I recently picked up this giant box of postcards. Once I start sending them out, I’m going to write exclusively in pencil. Will my messages survive until Antiquefest 2122? Could be. We attended a real estate auction this summer, and I picked up a box of old postcards. Many used, but some were not, amazing how beautiful they were, and how legible they still are 100 years later. I’m going to make a point of saving postcards from now on, and may try to track down more vintage ones (new rabbit hole!). This little find made me realize how nice it is to preserve even seemingly inconsequential pieces of our lives. I’ve gotten way more than a dollar’s worth of enjoyment from this old postcard. I bet there’s some interesting stuff in the box you found! i have always been a lover of postcards and enjoy getting and collecting them, and I especially make a point of sending them whenever I travel. There has been much good-hearted abuse directed at me for this especially from a cousin. “You and my father; always sending postcards”. One summer he was off to Flornece for some sort of course and left me with a detailed itinery including the name of the lodgings he would have for his visit. I immediately bought the schlockiest New York “Greetings From the Big Apple” postcard I could find and posted it to Florence with the request to hold for his arrival. The day he checked in the clerk greeted him with “Ah, signore, you have mail”.It may have been 10am when he was checking in but at 4am EDT I was still asleep, and he revelled in it. He now sends me postcards from whereever he goes. I even got on from Iceland a few months ago. What a great story! I tend to BUY postcards, then neglect to write and send them. Dumb! I plan to mend my lazy ways! I love old postcards, too! What a great post, Mary!!! Thank you, Carrie! I think I may actively hunt down more of these. I love the stories they trigger in my mind. 40-11; I never stopped using it! No, I don’t know from whence I got it. I’ll bet, my father. I suggest you use waterproof archival ink. I have seen postcards with badly smeared pencil writing. If you use pencil, select a harder grade of lead (e.g., 3H) to avoid this. The current domestic postcard rate is 35 cents. To make your postcards more attractive to future philatelists, use a variety of low-value stamps to make up that rate.